At Reflections Laser & Wellness, we use state-of-the-art Candela / Cynosure Lasers to bring you superior results. The success of hair reduction depends on many factors, such as genetics, health, and lifestyle – genetics being the greatest influence. Each treatment will be customized by one of our laser specialists. The ideal candidate for laser permanent hair reduction is anyone wanting to get rid of unwanted hair. To give you a better understanding of just exactly how laser hair removal works, it is important to know that laser energy is attracted to the melanin or color in the hair shaft and is absorbed by the melanin/color in the hair. 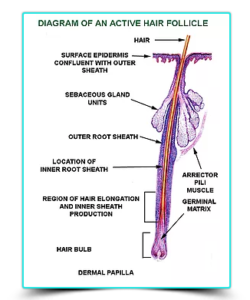 Heat then travels from the hair shaft out to the stem cells in the bulge near the top of the hair shaft and the bulb cells at the bottom of the hair shaft. If the wavelength is correct and the energy, pulse duration, and spot size are optimized, then there will be enough heat to kill the actively growing hair bulbs which lead to a permanent reduction. Hair removal is most successful over a series of treatments where most of the hair bulbs will be treated in active Anagen or growth phase. Once the right wavelengths and combination of wavelengths have been selected for you, the Reflections Laser & Wellness center laser hair removal treatment program can begin. Before your treatment the area is shaved quite short, so only a stubble of hair is emerging from the skin. The laser is then applied to the area and energy is delivered. The laser energy travels down the hair shaft, heating it up. The hair shaft acts as a lightning rod for absorption of the light-based energy from the laser. Remember lasers are a light looking for a dark so the absorption of the laser energy results in heat and the heat spread out from the hair shaft like a tunnel, down to the cells called the internal and external root sheath that is around the bulb, the hair shaft, and the bulge, where the primordial cells that lead to new hair during the telogen (sleeping) and anagen (growing) phases of hair growth. The treatment is fairly quick and after a successful treatment, you will notice the smell of photocoagulation (which is the smell of burnt hair shafts) as well as little red bumps and swellings around the hair shafts. As a result, you will notice extrusion of dead hair shafts over the first seven to 21 days following your treatment. Everyone needs to go through an initial six treatments continuing on with maintenance. How often will I have to come in for treatments? You will visit the office once every four to six weeks, depending on the area to be treated. There is some minimal discomfort during the treatment. It will feel like rubber bands snapping at you, and you will smell the sulfur content of your hair. There may be heat and mild redness for a short time but both are positive indications of a favorable treatment. Will I have to stay out of the sun? Yes, we do not want the energy of the laser to compete with your darker tanned skin. Can I exercise during my laser hair removal treatments? It is advised that you keep your body temperature cool both pre and post treatment to avoid any pigmentary or histamine reactions. Use common sense and treat the area as though you have a sunburn. Studies show that each treatment will produce an estimated 20% reduction of hair. You will begin to see a total reduction in pore size, along with smoother softer skin. Every area of the body can be treated and the most popular would be the face, underarms, legs, bikini, backs and chests.